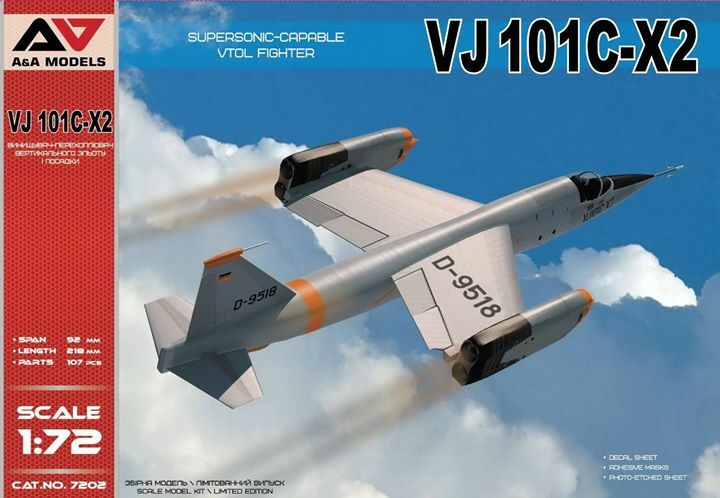 Here is our next 1/72 kit - the German VTOL fighter prototype VJ101C-X2.This original plane was designed in late 50-s by consortium between Bolkow, Heinkel and Messerschmitt named EWR iaw requirements of the German defence ministry for Mach 2 capable VTOL fighter. Overall, only 2 prototypes had been prepared for tests, the VJ101C X-2 was the second of them. VJ101C-X2 (#7202) is scheduled for release in mid September.Photo-etched sheet and adhesive masks are included.